Family gatherings and a big Christmas Dinner is central to the holiday celebrations in Brazil. RIO DE JANEIRO, BRAZIL – Celebrating Christmas in Brazil may seem completely foreign to those from the Northern Hemisphere where the cold and snowy winter is a primary ingredient. Yet family gatherings and a big Ceia de Natal (Christmas Dinner) is a consistent theme, and when it comes to the menu there are plenty of things to cheer about. 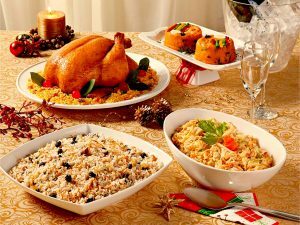 The main dishes served for Christmas dinner in Brazil are a turkey and bacalhau (codfish), photo internet recreation. The main dishes served for the holiday in Brazil are a Christmas turkey and bacalhau (codfish). The turkey is traditionally served with white rice flavored with walnuts. Bacalhau is dried and salted cod, and there are perhaps thousands of variations of the recipe, but for Christmas it often includes eggs, peppers, potatoes, onions and olives. A potato salad called Maionese, with apples and raisins is one popular side dish. Another side dish is Farofa, or fried manioc, and often tropical fruits, particularly bananas, watermelon and pineapple, will adorn the table. Perhaps the star of the show it rabanada, which no Brazilian Christmas Dinner would do without, photo internet recreation. Perhaps the star of the show is rabanada, which no Brazilian Christmas Dinner would do without. 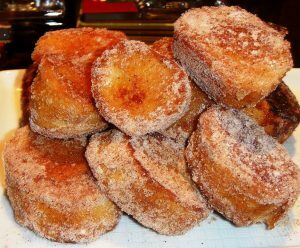 The word rabanada means “gust of wind” and it is similar to French toast – certainly the most traditional dessert served during the holiday. Some variations in the southern parts of Brazil are a German strudel and “stollen” (a cake containing dried fruits and marzipan), and an extremely popular Italian “panettone” (sweet bread) sitting next to the Christmas feast, displaying the strong European influence on the history and tradition of these regions. Following the country’s Iberian heritage, the Christmas meal is traditionally eaten late on Christmas Eve, either before or after a late night mass known as the Missa do Galo (Mass of the Rooster), named after the rooster that announces the coming of Christmas day.